Our website designing portfolio showcases the skills and expertise we possess to design any type of website that your business may require. With ideas and appealing design skills we can produce a modern, contemporary website design with the functionality that you require. Compusoft believes that a good website designing company is a one that adds value to the company not only by its extraordinary designing skills, but by understanding the domain of the company and accordingly suggesting web solutions, ranging from website design to search engine optimization, extending from E-commerce solutions to portal development and finally promoting sites through ad campaigns, thereby driving traffic to the website. 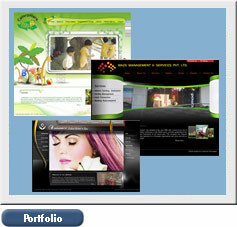 Our aim is to build neat, professional, interactive, content rich & good-looking websites in India and other countries. The primary objective of any company to have a professional website is to achieve its web presence highlighting its very purpose of existence. Setting up a website for a company or business does not cost as much as you may expect. Our web design prices are competitive & offer great value for money, and if you look at our portfolio you'll see our designs appeal to a wide range of clients, both large & small. We have designed websites for all major sectors namely Pharma, Textile, Hotel, Hospitality, Infrastructure, Financial , Construction and u name it. The most important mantra of any good website is, it has to be quick to load, nice to look at, easy to use and navigate. It should always be kept in mind that people will remember your website, if it is full of content rich and useful information.